It’s gardening season, once again. If you are an avid gardener, the spring finally allows you to escape into your seasonal hobby. Don’t allow yourself to fall into a gardening rut, however. Perhaps you are growing bored of tending to the familiar stock of perennials lining your sidewalk. Once a garden is planned, it is easy to fall into a pattern. But there is no reason not to experiment, if you have the space. A classic pergola is a handsome addition to any garden or green space. While these awnings are comely, they also provide the additional benefit of dappled shade, and a respite from the summer sun. Pergolas originated in medieval times, where springy willow was woven into an arching pathway on which climbing plants were grown. These leafy tunnels were intended as shelter from the elements. During the Renaissance, the pergola became larger and more dramatic, utilizing dramatic stone pillars in place of woven branches. The pergola went out of vogue briefly, while more naturalistic designs gained in popularity. In the 20th century, the pergola returned and has remained a mainstay in contemporary garden designs. Modern pergolas are free standing structures, usually made of wood, which may or may not be adorned with climbing plants. The main benefit of a pergola is the classic, tasteful beauty it provides. A naked pergola will create a lovely patterned shade in the summer time, while a pergola that has climbing vines trained onto it will create more complete protection from the sun. No matter how you choose to adorn a pergola, the shape of it will add some structure to an open space, creating sort of an open-air living room. Like any good design, a well-placed pergola will enhance the aesthetic feel of a yard or garden, creating an eye-pleasing accent. 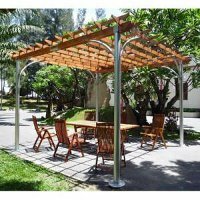 Many outdoor supplies stores offer pergola kits, which are exactly what they sound like. These come pre-packaged with all of the pieces cut and ready for assembly. While this is easy and relatively cost effective, it also creates a sort of formulaic, cookie cutter look. Only a custom built pergola will truly enhance your space, because it will be built with your individual space in mind. A contractor can assist you in designing a pergola that fits your needs. There are many choices to keep in mind, from placement and wood choice, to overall look. After the pergola is finished, there are enough creative questions to keep you occupied, such as choosing the right plants to adorn your new piece. It might be wise to leave the actual construction up to the experts. To learn more or to schedule a free assessment with a local contractor that builds pergolas, contact Signature Forum today! Featured Pergola Contractor: Illinois Retractable Screens, Ltd.